For years, there has been an unmet need for a clear professional development pathway beyond the entry-level Certified ScrumMaster® (CSM®) course. Now it is available as the “Path to CSP” from the world’s premier Agile professional development body: Scrum Alliance. Scrum WithStyle is proud to be the first organisation to offer this in Australia. Our Advanced Certified ScrumMaster (A-CSM℠) course is a exercise-based learning experience focused on skills acquisition to help you to take your leadership of Agile capability building to the next level. It builds on your learning and experience since you completed your CSM course. It is also a critical next step for ScrumMasters who are looking to attain the high bar of Certified Scrum Professional – ScrumMaster® (CSP-SM®). Here are some reasons to become to a CSP. A-CSM says to your employer and the jobs market that you have proven that you can work in a ScrumMaster capacity with teams. Watch Path to CSP Educator Rowan Bunning discuss the ScrumMaster role and professional development with Brendon Livingstone. Our A-CSM program involves a two day in-person course plus several hours worth of preparation work prior to the course. It builds on the foundations from CSM, providing the next stage of growth for ScrumMasters who want to help Scrum be adopted more successfully in their organisations. Our A-CSM is an invitation to bring your real-world context in for exploration and problem solving with a diverse group of experienced ScrumMasters. As well as coming away with a set of thinking and problem solving tools, you may even come away with fresh perspectives and new options for the challenges that you are facing at work right now. 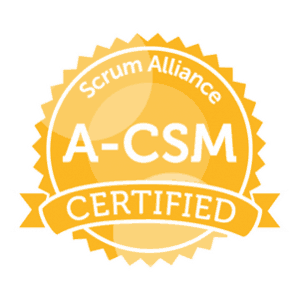 The course is delivered by Rowan Bunning, a Scrum Alliance Certified Scrum Trainer since 2008. Rowan became a ScrumMaster in 2003 whilst in Australia, subsequently working in this capacity with a leading Scrum-based digital consultancy in the U.K. and the Republic of Ireland. He became the first CSP in Australia in 2006 and the country’s first Path to CSP Educator in 2018. Rowan has designed this A-CSM course from the ground up to be experientially based with rich learning resources for you to discuss and enact. This minimises time spent listening to lectures and allows you to learn through multiple modes including through hands-on practice. It also provides many opportunities to learn from the experiences of the ScrumMasters in the room. Rowan puts the techniques into context with real-world examples from his Scrum experience over the last 15+ years. This course is for ScrumMasters, Agile Coaches, Iteration Managers and Delivery Managers, who understand the basics of Scrum, have over one year of ScrumMaster work experience, and hold a current CSM certification. Download a printable Advanced Certified ScrumMaster brochure (PDF).